The Namib Desert is one of the most surreal landscapes on the planet. The word Namib is of Nama origin, meaning ‘Vast Place’ and at 81,000 square kilometres, it certainly lives up to its name. Located in Namibia, Southern Africa, the ancient desert encompasses the western section of Namibia, including spanning the entire coastline and even spilling over into northern South Africa and Southern Angola. 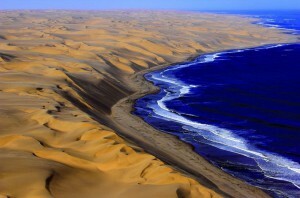 A large section of the desert makes up the Namib-Naukluft National Park, Africa’s 3rd largest protected area. Known as the world’s oldest desert, the Namib has been in existence for around 43 million years and comprises of vast gravel plains and scattered mountain outcrops inland, and immense ever moving rolling sand dunes towards the coast. At the coast the huge dunes are made up from linier and cone dunes, ranging in colour from pinky to orange and red, and make for a spectacular sight where the desert dramatically meets the ocean. The climate in the Namib ranges dramatically between regions and seasons, the lowest amount of annual rainfall is just 5mm a year experienced in the Western region, with the highest temperature being a scorching 45 degrees inland in the summer. When the cold sea air meets the hot current on the coast, fog can often engulf the region. 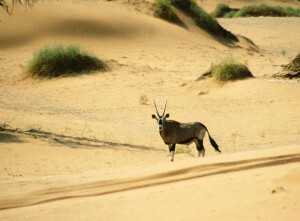 These conditions make habitation difficult for both man and animal, but surprisingly, there is much life in the desert. Evidence of human activity extends back to the Stone Age, and can be seen in many rock paintings and artifacts found over the centuries. The Namib is however largely uninhabited, apart from a few small settlements, and nomadic people’s such as Ovahimba and Obatjimba Herero in the north, and the Topnaar Nama in the central region. A few permanent settlements also exist such as a t Sesriem near Sososvlai and the coastal towns of Walvis Bay and Swakopmund. Animal life in the desert is surprisingly diverse, mostly anthropods and reptiles which survive on little water, but also some larger species have also adapted to desert conditions. The tok tokkie beetle is a favourite small creature with extra long legs to keep away from the hot sands, and with the ability to do head stands! At dawn the air is full of moisture and they climb to the top of the dunes to headstand facing west to receive the moisture on their back to trip down into their mouths. In some areas you can find species of gazelle and antelope such as oryx and springbok, hyena, hyrax, ostrich, the rare mountain zebra and even desert elephants! At Cape Cross there is one of the largest seal colonies in the world. The fauna is also extremely adapted and interesting – the Welwitschia plant for example is found nowhere else in the world, and gets its moisture from the foggy air in coastal regions. When it comes to experiencing this incredible place, on many of our tours we visit many of the highlights the Namib has to offer. 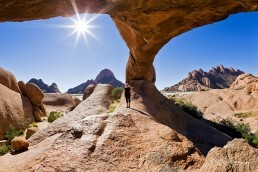 At Spitzkoppe, German for ‘pointed dome’, large granite outcrops rise out of the flat desert plains. This isolated area is a wonderer’s paradise, with many rock outcrops to explore, and at sunset and sunrise the light and shadows cast over the ancient rocks create awe inspiring views. The Spitzkoppe area is ran by a women’s co-operative, who maintain the campsites from where you can hire a local guide to give you an insight into the area. On the coast, the German settlement town of Swakopmund holds a wealth of activities and adventure. The town itself has a distinctive European feel, left over from the colonial era, with its palm-lined streets, many café’s, coffee shops and curio shops. This lovely town is a great place to spend time wandering. There are also many adventure activities on offer. Skydiving over the desert, with the ocean in the distance, is a truly incredible, once in a life time adventure. For a little more of an adrenaline rush sand board on the huge dunes, or explore the desert by quad bike. Other activities on offer are guided walks in the desert to discover the flora and fauna, or a scenic flight so you can take in the size of the dramatic landscape, and open sea fishing and dolphin cruises. 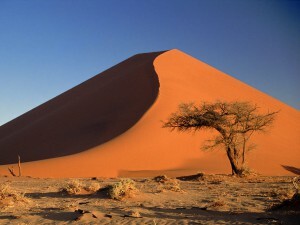 Another incredible gem of the Namib is the Sossusvlei area, where the spectacular red orange dunes can be found. Again at sunset and sunrise the colours of the dunes make for amazing viewing, the famous ‘dune 45’ so called as it lies 45km from the settlement of Sesriem, can be climbed and it’s unusual shape and relatively un-steep sides make it fun to scale, and to photograph. With so much on offer, it’s easy to see why the Namib Desert draws adventurers from far and wide.